Clear as crystal and hydrating as water, this innovative Hydra-Mousse is scientifically formulated for super-fast absorption to deliver a believable, natural-looking tan while increasing skin’s moisture levels. Featuring skin care grade vitamins B5, C and E and raspberry seed oil, the luscious, light-as-air formula bestows undetectable golden glow within 4-6 hours. 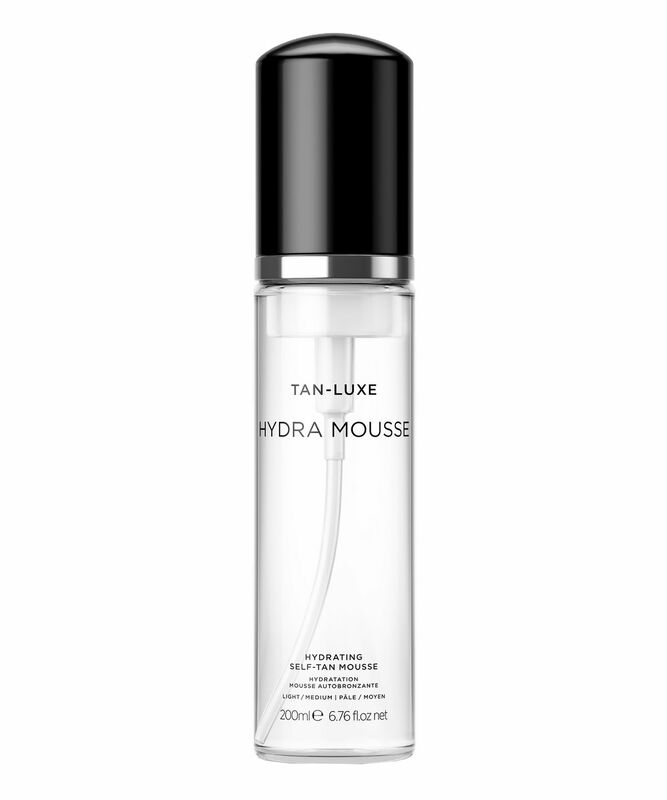 An innovation in fake tan, TAN-LUXE’s Hydra-Mousse is the speediest way to fake a sun-drenched holiday – and skip all of the skin-damaging rays. The clear-as-crystal water pumps out as luxurious foam, which has been scientifically formulated for super-fast absorption. Blending seamlessly into skin, it develops into a sun-kissed, radiant glow within 4-6 hours and is available in two skin-flattering shades – ‘Light to Medium’ and ‘Medium to Dark’. Enriched with skin care grade vitamins B5, C and E plus raspberry seed oil, this fabulous foam hydrates as it illuminates, so that skin is left perfectly conditioned as well as gorgeously golden. Exfoliate using a gentle scrub 24 hours before tanning. Apply: Using a tanning mitt, apply to the skin in a circular motion from head to toe. Use sparingly on hands and feet. Your tan will start to develop within 4 -6 hours. Do not shower for at least 4 hours post application. During development time do not participate in any activity which may cause excessive perspiration. Thoroughly wash hands after use. Maintain: Gently exfoliate and moisturise skin daily to maintain an even, luminous glow. Self-tanning companies around the world - watch out! This product is BY FAR THE GREATEST self-tanning product known to womankind (or mankind). Do you hate self-tanner smell? This product is for you. Do you hate tan-stained bedsheets? This tanner is for you. And if you HATE awkward undertones in self-tanners that never develop evenly...well my friend, this one is for you. Radiant glow, natural colour, and keeps your skin plump and hydrated FOR DAYS. Seriously, the gods shined down on Tan Luxe when they created this formula. This has a beautiful texture. Mousse's are normally drying on the skin but this feels so creamy and light and leaves it beautifully hydrated....even elbows and knees! Dries quickly. The colour is really natural yet dark (I got the dark option as I like a dark tan). I do like how it doesn't have a guide colour. You don't have that tan smell during the night and no staining of clothes or bedding. Definitely worth the price as it is a very high quality product.